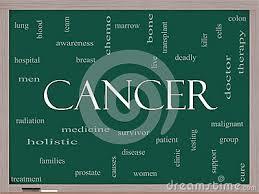 Many Cancers Can Be Detected When They Are Still Curable. Don’t wait for bad news. Possibly it’s human nature, or possibly it’s a holdover from 19th century medicine, but when it comes to serious disease, many would prefer to simply not know. There is some sense to this if the disease is incurable. Anyone can get the genetic test to see if they will develop, for instance, Huntington’s Chorea, the disease that killed Woodie Guthrie. But this disease isn’t curable. Would you want to know or not? There is also a gut level belief that cancer=death. And for good reason. Cancer is a major killer, and in many cases, the most medicine can do is reduce the pain. Heart disease is down, and cancer is poised to take over the top spot: Killer #1. Even so, cancer IS NOT a case where preferring ignorance makes any sense. Many “killer cancers” are quite curable if diagnosed early. And many die painfully and needlessly from these curable cancers. Now cancer isn’t something you get. You’ve already got it. We all have. It’s a question of progression—of whether your immune system, your primary defense, knocks it out or not. If it doesn’t, and a bunch of other things occur, the cancer becomes dangerous and possibly lethal. We have around 100 trillion cells, and at any given time, several million of them are broken. The vast majority of these cells simply die, and pose no health problem. But some of them start dividing uncontrollably. Now we have broken cells replicating. And their duplicates replicating as well. This is the start of a cancer. It is way too tiny to be detected by a medical test at this point, but it’s not too tiny for the immune system. Several immune system cells “specialize” in detecting these tiny tumors and will destroy them at once. Some cancers can fake out the immune system, and some can replicate fast enough to overwhelm it. These are the one that are dangerous. These grow. When they are about the size of a pea, they can be detected by imaging techniques. Some can also be detected with blood tests or even by breath tests. Now then, lets look at what screening can accomplish. Here is a cancer risk chart. The “Localized” is the early detection column, “Lymph node” indicates some spread, and “Metastatic” indicates a large spread. Look at prostate cancer. 15% of the population gets it. Women never do, of course, so that’s 30% of men, though the number is probably higher. Prostate cancer is the “turtle” of cancers and can take decades to develop. But note that even though it is 100% curable, about 20% of those that get it, die from it. There is, of course, only one explanation for this: These men weren’t screened. Why? Either their doctor didn’t order the test, or they weren’t getting checkups in the first place. For Malignant melanoma, squamous cell skin cancer, breast cancer, colorectal cancer, and bladder cancer, the cure rate is very high, over 90% if caught early. Yet these account for 45% of all cancers. Nobody should be dying from these cancers, but around 20% are. And again, the reason is that it wasn’t caught early. Don’t adopt an “I’d rather not know” attitude. There is no need for this. There is a lot that can be done with a case of early detection, plus the treatments are typically far less troublesome. Remember that we all have millions of tiny cancers. Don’t take “no” for an answer. You will hear: “It’s not cost effective” from your doctor. Cost effective? From whose point of view? The insurance company’s you can bet. You may have entirely different notions about “cost effectiveness” when it’s your own life on the line. Insist. If the doc refuses, go shopping for a new one. Or get the tests yourself. Possible and legal. A full body scan with a virtual colonoscopy plus a couple of blood tests can tell you a lot. This will cost under $1000, but not much under. If this sounds a bit pricey, you might compare it to car repair. Of course you need your car. You’ll pay for the repair. Or you might choose to replace it. No such option with your body. In the past insurance typically did not pay for most cancer screening; a dead patient doesn’t need MRI’s, blood tests or even medicine. That’s where the cost effectiveness of not screening came from. There is little excuse not to have a broad cancer screening checkup. I know, I know you have to pay for the kids braces. We all want a great smile but life itself is worth having. ← Get Well With Aristotle!